Fireswift skims along the water in Limerick. 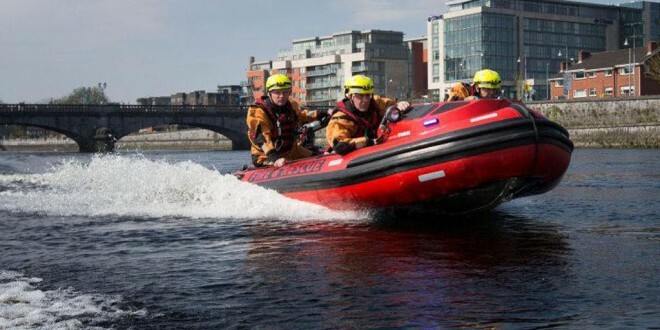 FIRESWIFT, a new custom made power boat specifically designed for use on the River Shannon has been formally launched by Limerick Fire and Rescue Service. Mayor of Limerick City and County, Kevin Sheahan, officially launched the powerful 4.6m RIB at the pontoon in Steamboat Quay, Limerick. The 4.6m RIB can be launched in less than a minute, as it is permanently moored on a floating pontoon. The fastest emergency response on the river, FIRESWIFT can be mobilised within three minutes from the time an emergency call is made and will be used by the Fire Service in conjunction with inflatable rescue sleds. More than 160 children had taken part in a competition to name the boat, with successful entrant Ellie Mae Rooney (11) a fifth class pupil from the Salesian primary school receiving an iPad, sponsored by local company Amber Fire. Mayor Kevin Sheahan said, “It is a pleasure to launch such a service, which is one of only two boats of this type in use by fire brigades in the country, the other being utilised in Dublin on the River Liffey.